Grooming a dog is a complex operation which includes brushing, bathing, teeth/nail/ear care and trimming. You can pretty much do all this at home on your own and it will be okay. 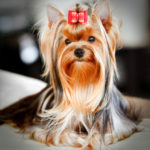 But in case your Yorkie is a show dog, you’d have to apply an advanced care aswell, which is beyond the scope of this article, however you can just use the service of a professional groomer 4 times in a year, if you really want your dog to be perfectly groomed and look “fashionable”. 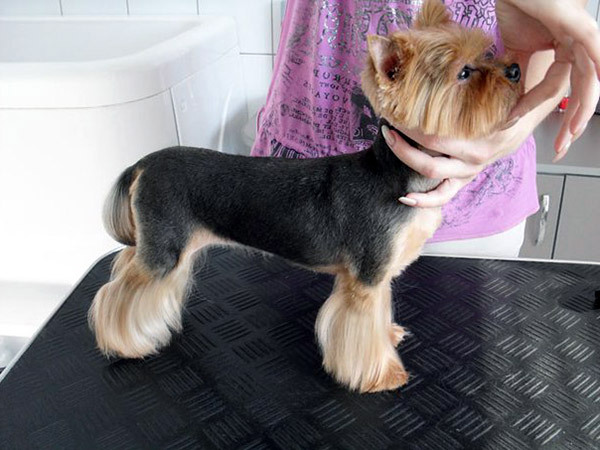 Here we discuss the mandatory basics of Yorkshire Terrier grooming. 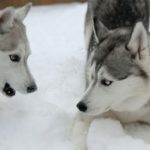 First thing you should consider before brushing is the condition of your dog’s coat and skin: if both are oily, than skip this paragraph; if coat or skin is dry, then it requires moisturizing beforehead, because otherwise it will be damaged in a process. Normally there are natural oils which keep skin and coat oily to some extent, which is healthy. But this natural process may be broken (due to unbalanced nutrition or too frequent bathing, for instance), which causes dry skin and coat. Before you solve any health problems affecting this, you should use a spritzing coat conditioner before brushing. You can buy one or just make it yourself by mixing 1 part of dog coat conditioner and 5 parts of water in a spritzer bottle. 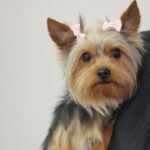 Tip: if you are planning to bathe your Yorkie after the brushing, then it’s better to just brush your dog slightly before the bathing without a conditioner and then use a conditioner in a 2 in 1 shampoo, or after the initial bathing. 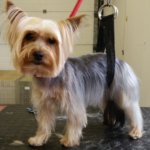 Brushing should be done daily with a pin brush with non-rubber back and full metal tips to avoid damaging the Yorkie’s coat. You need to brush from the roots of the hairs to their tips. 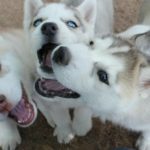 You may start brushing your dog from his shoulders where he is less sensitive, in case he resists brushing. Advice: if you encounter any knots, try to tear them carefully with your fingers. 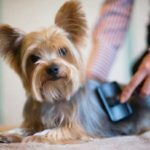 If a knot turns out to be too dense, then place a comb between the knot and dog’s skin and cut it off with a pair of scissors. Bathing should be done one a month. 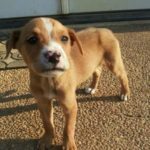 It does not require much supplies: a dog shampoo (creamy and tearless one is preferable), a hair conditioner (may be part of 2 in 1 dog shampoo), a towel and some warm water. Make sure you have brushed your doggy before bathing to avoid tangles. The bathing can be done in a sink if your dog feels uncomfortable in a large bath. 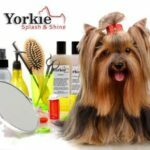 Wet your Yorkie completely, get some shampoo on your hands and soap your dog from the top of the neck to the end of the tail. Then soap the dog’s head. Wash away the shampoo with warm water for about 3 minutes to make sure there will be no soap residue for it can damage the dog’s skin. Attention! Do not use a human shampoo. It can damage your dog’s skin, because humans and dogs have different pH on their skin. 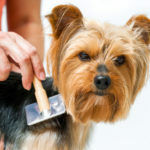 Apply the hair conditioner to your dog’s coat and let it set for 5-10 minutes before washing off. 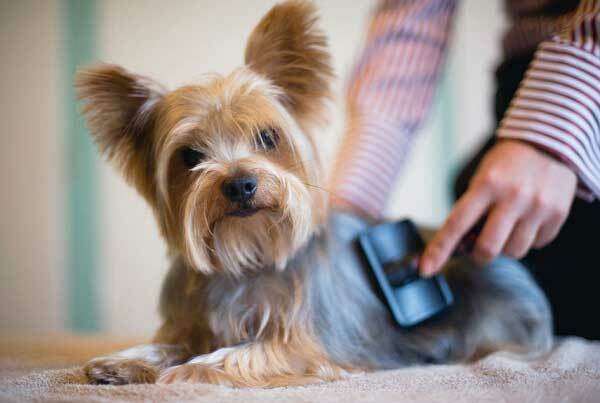 Use a towel to dry your Yorkie and brush it’s coat. It’s better not to use a dryer for this. Use a finger pet toothbrush or any other toothbrush and a pea of toothpaste for dogs(human toothpaste contains too much fluorine) to clean Yorkie’s teeth. 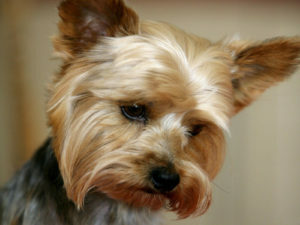 This procedure should be done each day because Yorkshire Terriers are prone to teeth and gum diseases. Keep in mind that dental medication and surgery is always expensive. For the nail care you need a tool called nail clipper. 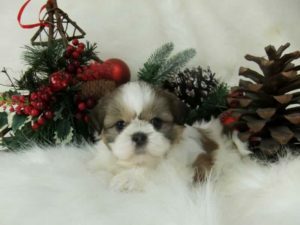 Clip the very tips of the dog’s nails and pay attention to dark blood vessels and nerves in the nails. If you cut them, it wont be fatal, but they may bleed a lot (use a styptic powder to stop the bleeding). For the ears use an ear cleanser/ear wipes. Rub it in a circular motion and use a dry wipe to absorb all the liquid remained. Important! Clean the ears once you see any wax, you dont need to do this daily. 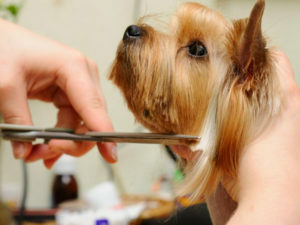 Trimming should be done with grooming scissors having blunt tips in order to avoid any injuries.Trim the feet first: gently hold the dog’s foot and cut the hair on the front of the foot in a semi-cricle but dont touch the hair on the top of the paw, but trim the extra hair between the pads. 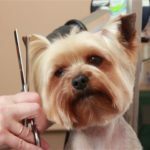 Trimming Yorkie’s featherings and beard is optional, you may search for different grooming cuts in the Internet and choose whichever you like. Make Sure! The haircut isn’t obstructing the dog’s line of sight. If you want a complicated grooming cut for your dog, it’s better to use the service of a professional groomer.